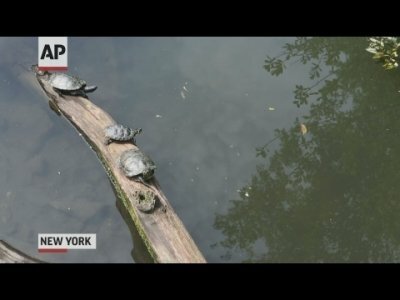 NEW YORK (AP) — On a scorching summer day, Mark Stoeckle threw a bucket into the murky waters of New York’s East River to fill up three small plastic bottles. The biologist hopes the water he collected contains the genetic trail of the river’s diverse life including all of its fish — and of course, the occasional rat. He doesn’t have to catch the slippery fish himself —a dangerous task given the river’s rocky bottom and strong currents. He just needs to look for the tiny bits of DNA they leave behind to track them. Animals lose hair, scales and feathers as they move. They also discard skin cells and waste. All of these leave traces of genetic material that can be detected hours, weeks or even millennia later. Scientists say analyzing the DNA floating in waterways or hiding in soil, which they call environmental DNA or eDNA, promises to help in managing and protecting biodiversity. The tactic has become increasingly popular within the past few years and has already provided clues of ancient mammoths in Siberia, early warnings of frog die-offs in California and evidence of elusive sawfish in Mexico. For Sam Chew Chin, a fish ecologist at York College in New York, the DNA sampling reminds him of childhood shows he loved such as Star Trek. Chew Chin said he used to be a “muddy-boots and bloody-desk biologist.” Studying fish meant capturing them and eventually killing them. Now, he searches for whales off of Long Island or fish in the Hudson River by testing water — an advance that has made his job faster and cheaper. It wasn’t always like that. Nobody really cared about eDNA a decade ago, said Danish geneticist Eske Willerslev, who pioneered the technique. He had been traveling to Siberia to sample permafrost. The frozen soil was so cold that he thought ancient genetic material could have remained intact throughout the years. In 2002, with a handful of permafrost samples the size of a sugar cube, he was able to identify the genetic material of bison, horses and many different plants that lived hundreds of thousands of years ago. He also found the preserved DNA of mammoths. Environmental DNA “helps us reach the inaccessible,” said Willerslev from the Natural History Museum of Denmark, adding that this approach will play a key role in scientists’ quest to understand nature. Examples of this are appearing in other fields, where eDNA has changed how researchers think about conservation. When Colleen Kamoroff spent the summer collecting water in 2015 from the lakes in California’s Sierra Nevada, she saw a healthy group of native mountain yellow-legged frogs hopping around. One month later, they were all dying. The culprit: a microorganism that has caused the decline of about 200 amphibian species around the world, called chytrid fungus. Curious whether the frogs could have been saved if she had seen early signs, Kamoroff, a wildlife biologist who works for Yosemite National Park in California, started looking for chytrid fungus DNA in the water she had sampled. She was surprised to find it. “Maybe if we knew they were infected at that point, we could have been more prepared. We could have started treating them” with medication, she said. If a species is reduced to the verge of extinction, protecting the area where animals live or breeding them in captivity can sometimes help rescue it. It’s been done before. But knowing where those last survivors hide is a common headache for conservationists. Marine biologist Ramon Bonfil has spent more than three years looking for the last sawfish of Mexico where tropical waters were once teemed with the elusive and strange-looking rays. Now, they’re nowhere to be found. The last specimen was accidentally caught in 2016. Other than that, no one has seen a live sawfish for almost a decade. Gill nets, drones and fishermen have all failed to spot them. Bonfil, however, discovered sawfish DNA in three water samples he took two years ago in the state of Veracruz. It’s a weak signal, which could mean there aren’t many creatures swimming around. But it’s recent. “The key is knowing where they are. Until we find them, we won’t be able to protect them,” said Bonfil. For Stoeckle, fishing for free-floating genetic material in the East River every week for the past couple of years has changed his outlook.